Showing results for tags 'chews'. When I first put an orange flavored TruJoy Organic Original Fruit Chew in my mouth and began chewing, I soon noticed an intense explosion of orange flavor. It reminded me a bit of the Starburst candies that I used to eat as a child—but instead of containing corn syrup and artificial junk—these chews are organic and contain real fruit juice and cane sugar. The texture and chewiness was great, and it seemed to last forever. Other flavors in the package included strawberry, cherry and lemon, and each of them was just as wonderful and intense as the orange. I also got a bag of TruJoy Organic Choco Chews, and again, when I put one in my mouth and chewed it I was brought back to an old favorite of mine called a Tootsie Roll, but like the Organic Fruit Chews, the Organic Choco Chews use only organic and natural ingredients, and you can really tell the difference. Another think I like about this company is that they are a member of “1% For The Planet,” and donate a minimum of 1% of their revenue to organizations that support environmental causes. If you like healthier versions of some of your favorite candies, and like companies that contribute to the environment, TruJoy chews are a perfect fit. 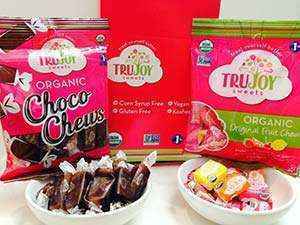 For more info visit: www.TruJoySweets.com. Review written by Scott Adams.